Almost all of us are using smartphone today and mostly all phone supports AAC or M4A audio format for the audio files. The audio quality of AAC file is better than the WAV and MP3. Therefore, many people would like to convert MP3 to AAC files for better auditory experience. So let’s learn about how to convert MP3 to AAC with two helpful methods in this guide. KeepVid Online Video Converter is a free facility provided by KeepVid, and it can help you to convert MP3 to AAC format online. This website is totally free to use without installing any other third-party software. Although there are lots of video converter websites available over Internet, they can’t maintain the quality of the converted files. KeepVid Online Video Converter will convert your videos or audios in the original quality so that you don’t have to worry about the loss of the video quality during conversion process. KeepVid Video Converter is a best professional video converter program for you from KeepVid. With the desktop video converter, you can keep the audio quality of the MP3 file after converting it to the AAC file. 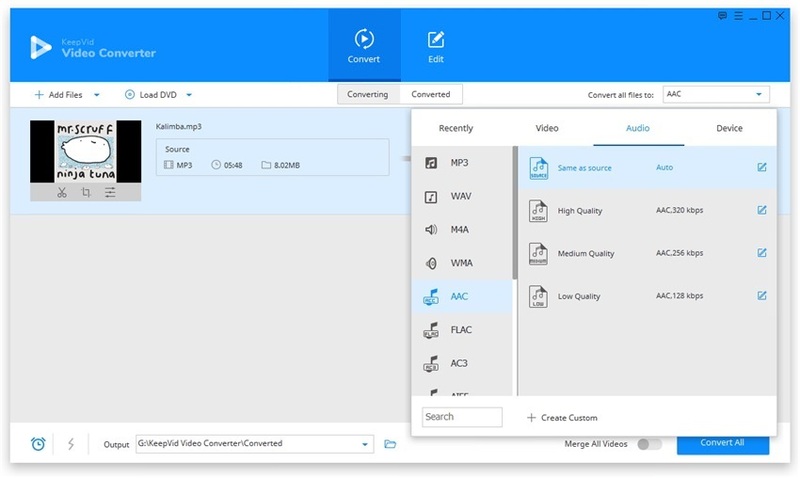 KeepVid Video Converter also provides you the feature of downloading videos. Both Windows and Mac versions of this desktop video converter are available. 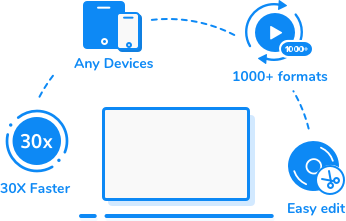 Convert video and audio files to more than 1000 video & audio files. Edit videos with 3 powerful features, including trimming, cropping and adding effects. Download videos and music from more than 10,000 video sharing sites. Keep the video quality during the conversion process. Step 1. Start KeepVid Video Converter and add your MP3 file from computer. Step 2. Select AAC as the output format, and then click the Convert button to start converting MP3 to AAC. Step 3. When the conversion finishes, you can get the converted file in Converted tab. Download and install KeepVid Video Converter in your computer, and then start it. After that, choose the Convert section at the top middle of the main interface. Now click the Add File or Add Folder button at the upper left corner of the main interface to add the MP3 file from your computer. You are also allowed to drag and drop the video into the program window directly. 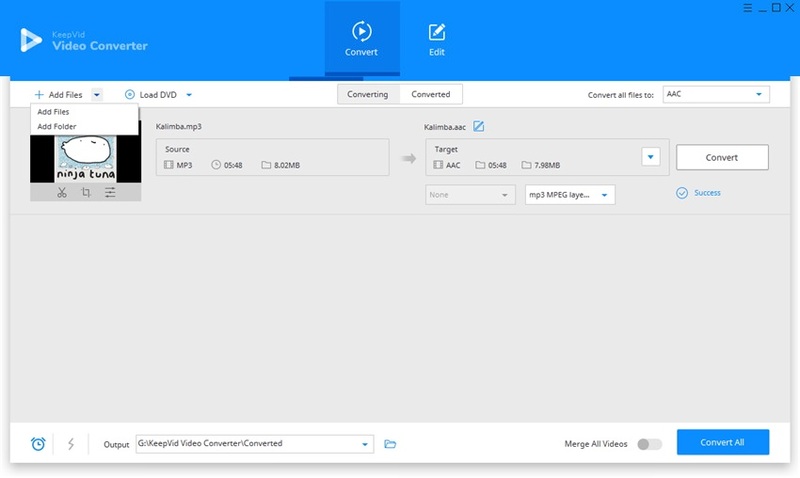 KeepVid Video Converter will load the MP3 file and show its detailed information. Now you can click the inverted triangle at the right side of the Target area, and select AAC as output in the pop-up window. You can also click the inverted triangle beside the Convert all files to button, and select AAC as the output format in the pop-up window. After that, click the Convert or Convert All button to start converting MP3 to AAC files. AAC format stands for Advanced Audio Coding. This is an audio file type and promoted by developer as successor of MP3 format. AAC files are usually takes less amount of space on hard disk or equal to the MP3 but audio quality is always better than the MP3 format in the AAC format. This is the only reason why people use AAC format on their mobile devices because they can store more files in the less space.